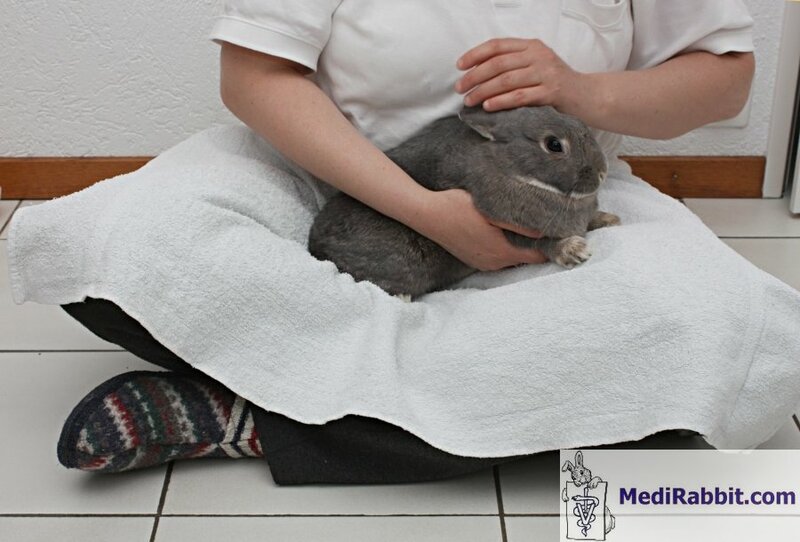 To enable a safe physical examination of the rabbit, it is imperative to cover the examination table with a non-slippery material, covered with a blanket or towel, to avoid sliding. 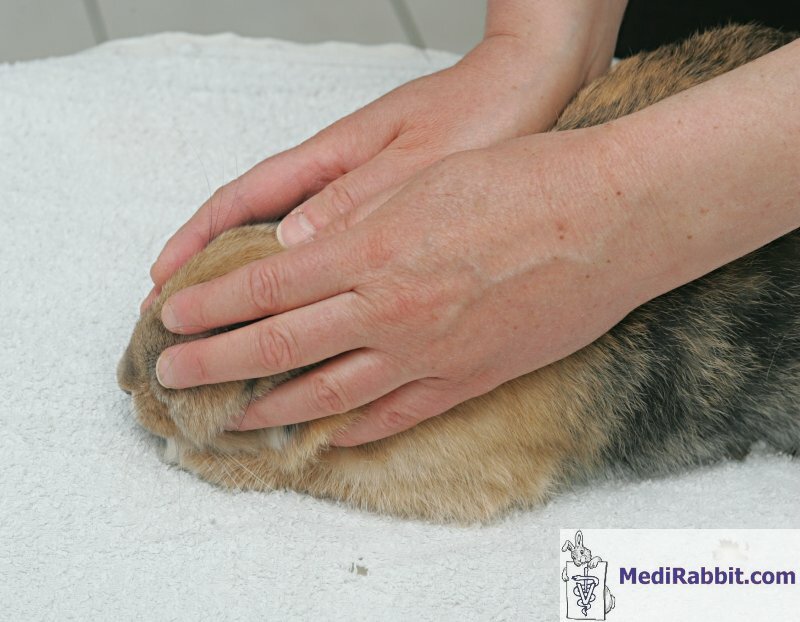 Since rabbits are ground dwelling animals, and do generally not like height, the examination can also be done with the veterinarian sitting on the floor or on a chair, and placing a towel on his/her lap. Pixel's patience with the vet runs thin during her semi-annual check-up. 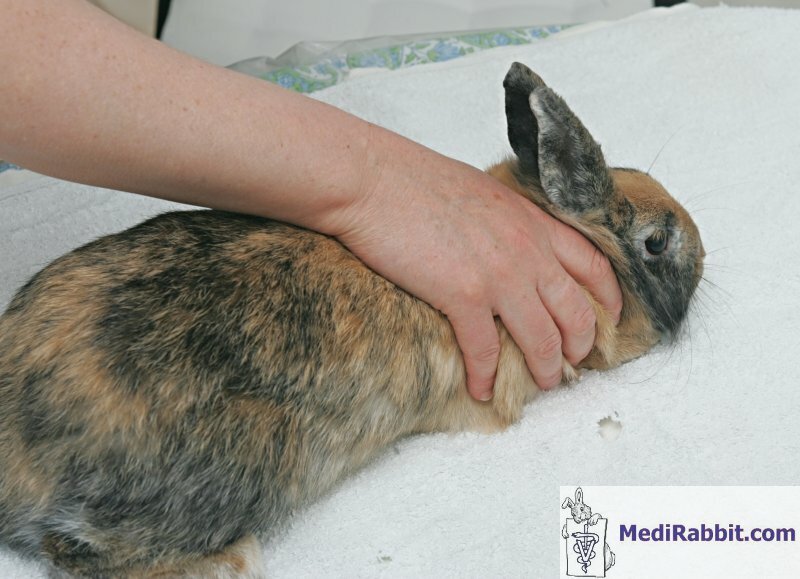 After picking the rabbit out of the carrier and placing it on the examination table or lap, it is important to respect the natural curving of the back, arched downwards, to prevent twisting, and not stretch it in the length, with risk of causing a vertebral luxation or fracture. 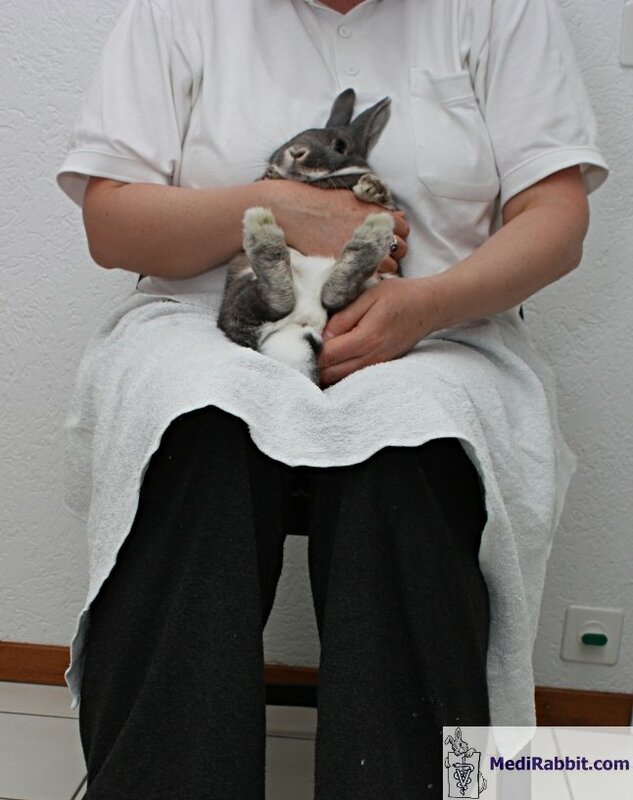 Before the examination itself, it is important to calm the rabbit. 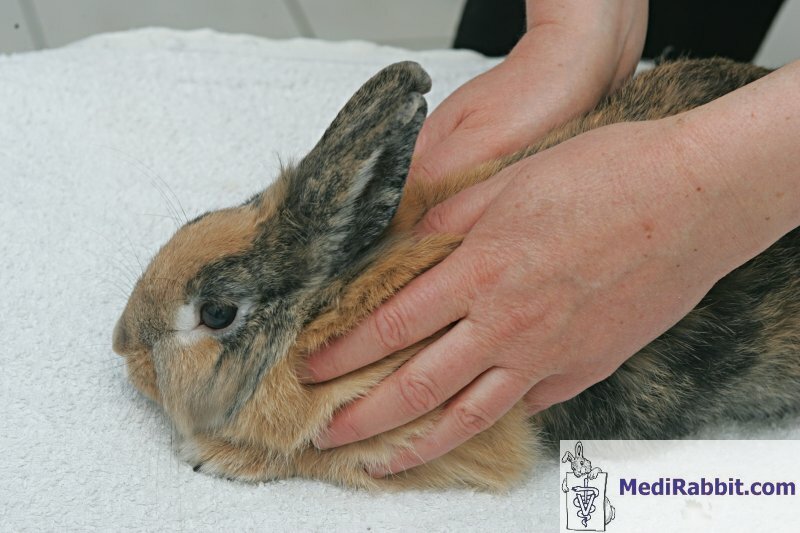 This can be done by petting gently over the head and body, and covering the eyes. Some rabbits are able to calm down to the point of starting to “purr” and softly grind their teeth. The following illustrations show general and safe methods of containing a rabbit. The assistant stands or sit on the side of the table and approaches the rabbit from the side or the back with slow and calm movements. 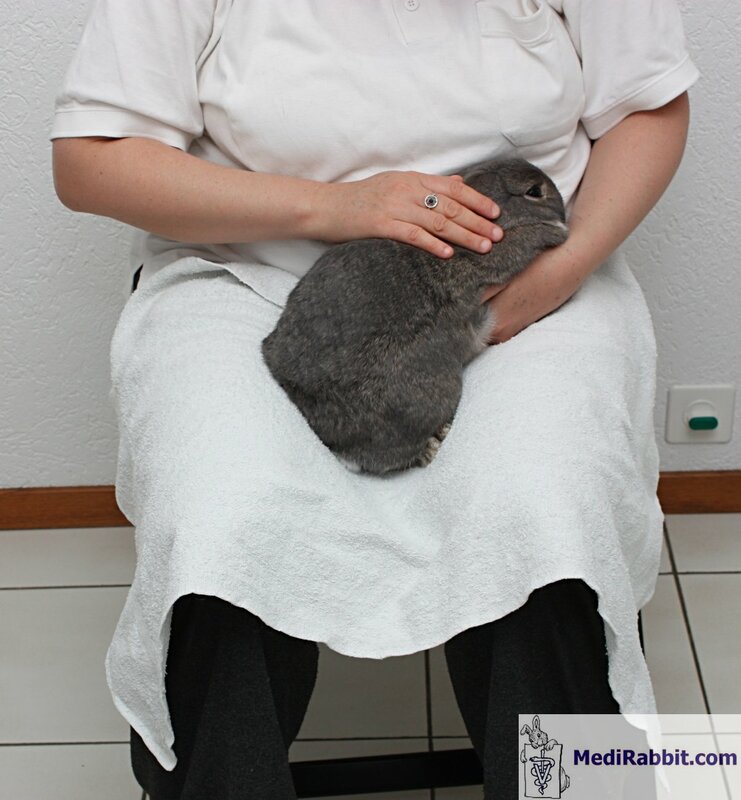 Depending on the experience of the veterinarian, the size and weight of the rabbit, the approach may slightly differ. The rabbit is sitting in a compact posture, with two hands placed lightly over the shoulders of the rabbit. A good examination can only be done on a calm rabbit. 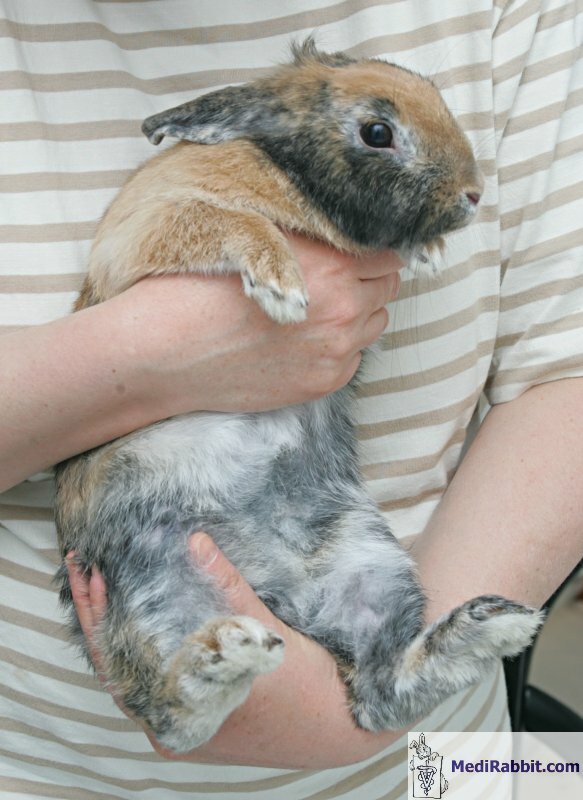 This is impossible when restraint is too tight, and the rabbit will attempt to bite and scratch the holding hands and escape. Thus, even aggressive rabbits are best restrained lightly, with control of eventual biting attempts. 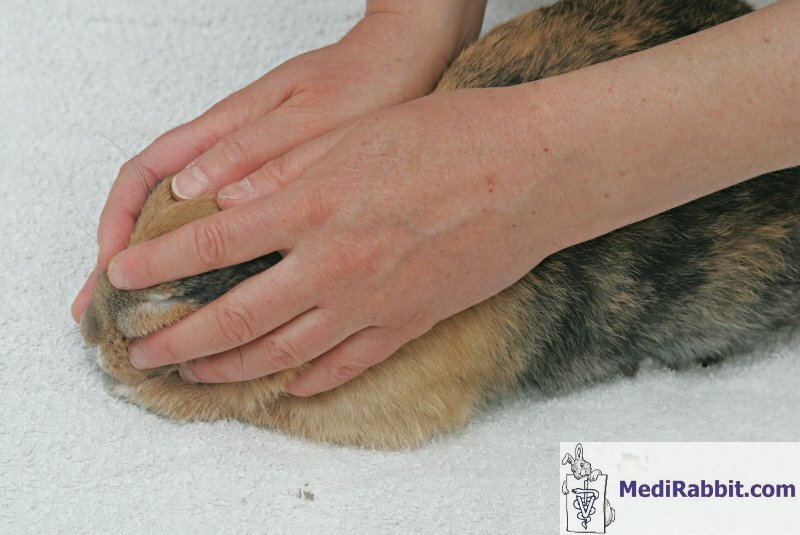 If the rabbit is very shy or frightened, hands can be placed on both sides of its head, covering the eyes. While calming the rabbit, by preventing to see its environment, it also avoids attempts of escape. Rabbits are curious by nature and have a tendency to discover their new environment. It so happens that the rabbit stands up to inspect the new environment. 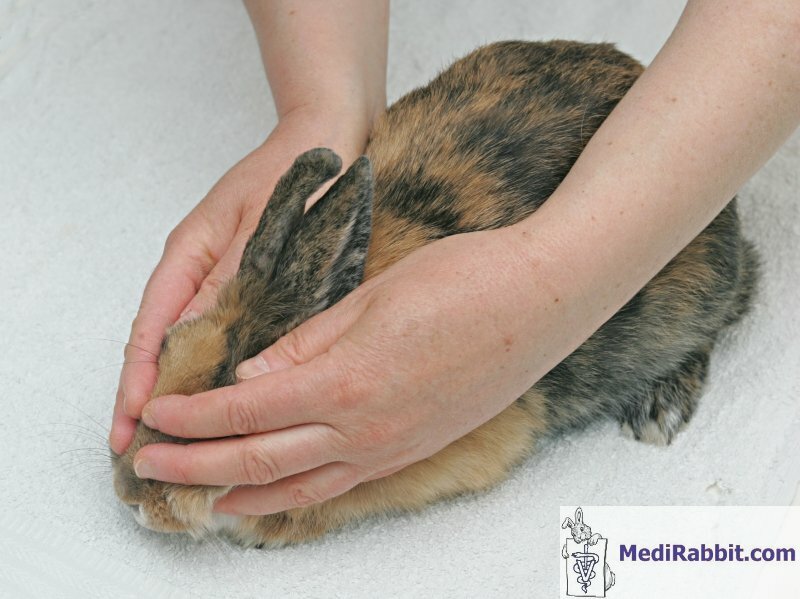 A hand placed firmly over the shoulders, or around the shoulders and posterior limbs, will make the rabbit stop from moving, and crouch downward. 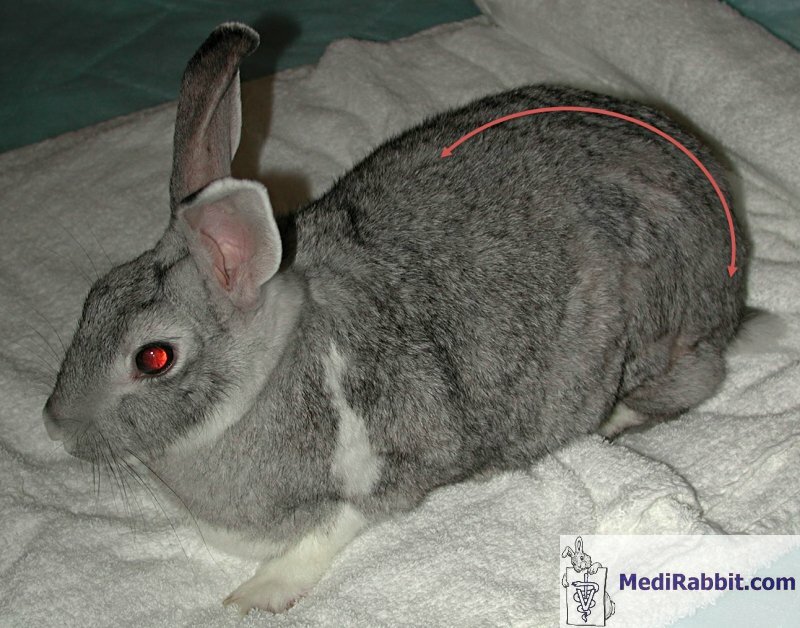 If the ventral abdomen must be examined, the rabbit is held firmly against the chest, with support of the lower part of the body. This can also be done when sitting on a chair. 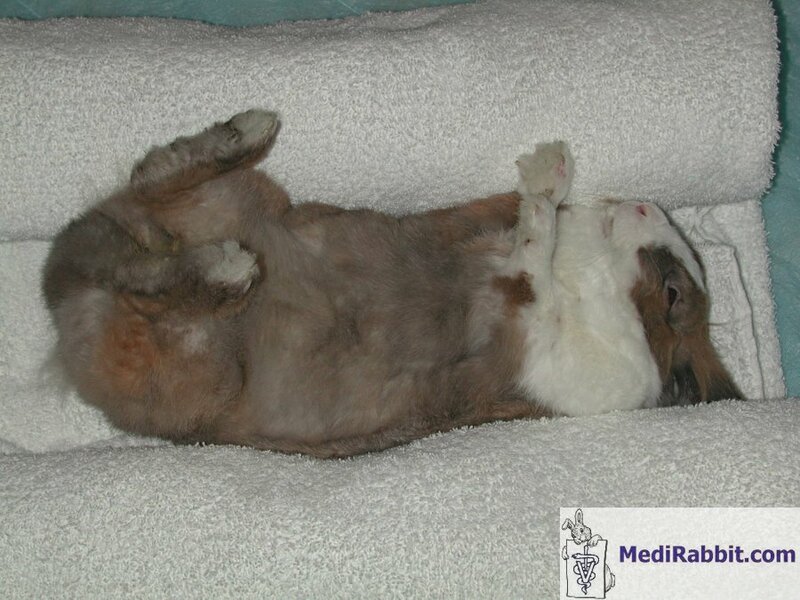 In case the rabbit must be placed in lateral or dorsal recumbency (on its side or back), e.g. examination of the ventral region for the presence of an abscess, radiography, it is recommended to sedate or anesthetize the animal. Indeed, most will start to struggle and quick with their hind feet when attempts are made to place it on its side or back. Consequences can be catastrophic. 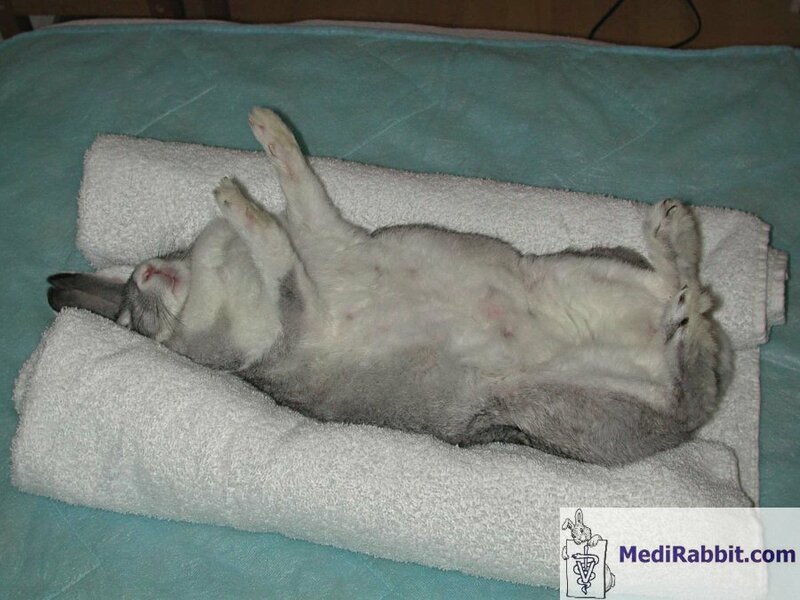 To avoid rolling over, towels can be rolled on the side of the rabbit, to prevent it from falling, or, if awake, from turning and falling from the examination table. 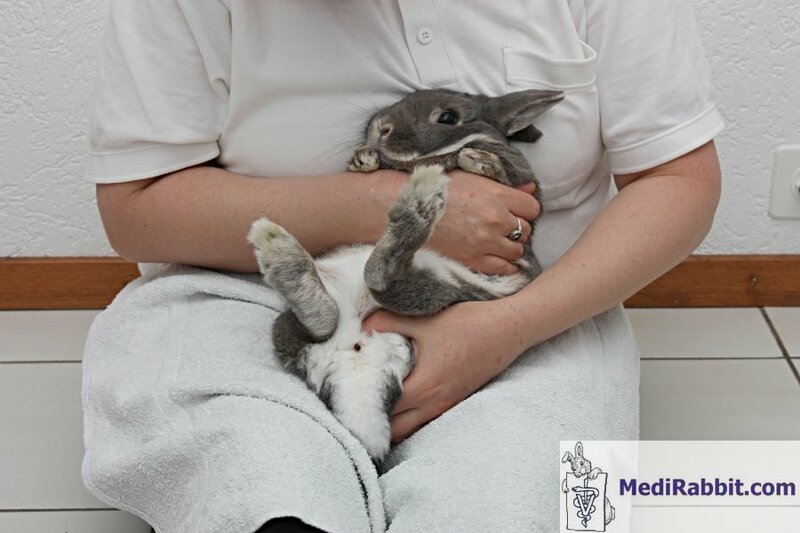 After the examination, the rabbit is carried back to the transport carrier. 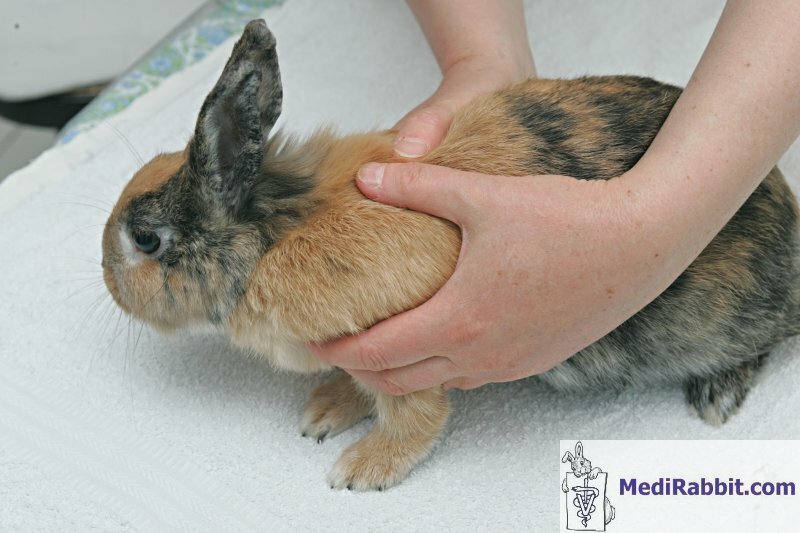 The easiest way to bring back into the carrier is to hold the rabbit in a way that its head faces the person holding it when lowering the hind-part of the rabbit through the top opening, followed by the upper body. If the carrier has only a front door, the rabbit is put inside, bottom first. Thanks to Yara, Kaspi and Grijsje for demonstrating various restraint methods.